Certain artists come to define certain record labels – Bing Crosby was synonymous with Decca for years during their reign in the pop era – and in rock ‘n’ roll it was no different. Little Richard’s popularity seemed to re-shape the entire output of Specialty Records after they’d already been quite successful with a wide array of singers, but following Richard’s breakthrough they increasingly sought artists who could replicate his high energy approach. Sometimes the artists don’t even remain at the company in question for very long, as anyone who immediately thinks of Sun Records when hearing the name Elvis Presley well knows, but their presence defines that label forever after. It doesn’t even have to be an artist per say who becomes the face of the record company, as somebody like Mitch Miller was far more important – and in many ways a bigger name even to the general public – than any of Columbia Records’ roster of stars in the 1950’s. For a small label like Miracle Records this would likely be the case even more, since their roster was decidedly limited and their sales were largely confined to just a handful of names. Though bluesman Memphis Slim scored consistently with them as well, it was Sonny Thompson who came to represent Miracle Records best. Not only did he have the biggest – and most – hits the company released during its six years of existence, but he also played behind other artists on the label in his role as the leader of the band in the studio. That’s why when you learn that the session today’s record was recorded at was the last time Thompson was employed by the label it’s not hard to see why Miracle Records was on its way down. It’s hard to make the case that Sonny Thompson was still anything but a success as an artist after he’d made the leap from session pianist back in early 1948. Every one of his releases – until this one that is – made the charts, a ratio unmatched by any other rock artist with as many records to his credit. But looking closer at those statistics we see a troubling trend emerging. His debut – Long Gone – was of course the biggest rock hit of all of 1948, therefore it’s not entirely fair to use that as the barometer to judge his future releases. What wouldn’t pale in comparison to that after all? Furthermore since its follow-up, Late Freight, also hit #1 it’s not as if there was a steep drop off even then. He followed that with two more singles which both scored as well… but look closer. Those initial two hits charted in Billboard for a combined 44 weeks. His other three songs which made those same charts only did so for a combined four weeks. That’s hardly an equitable return any way you look at it. The reasons for this are pretty apparent too. His next effort, (Blues On Rhumba backed with Blue Dreams) each made those charts for only a week apiece, indicating that listeners eagerly anticipated the record’s release and expected more of the same out of Thompson but once they heard it were let down and stopped playing it on jukeboxes and told their friends not to buy it. The songs just didn’t give that audience who’d embraced him anything they were looking for. Now you can certainly say this makes perfect sense, since those sides were recorded in late 1947 before his hits had been released. Not knowing the response those songs were in for, he simply was casting a wide stylistic net, trying a bit of everything. Fair enough. But that brings us to the missteps of Miracle Records themselves who saw fit to release those inappropriate sides paired together as their first release of 1949 when it was vital they keep his momentum going. 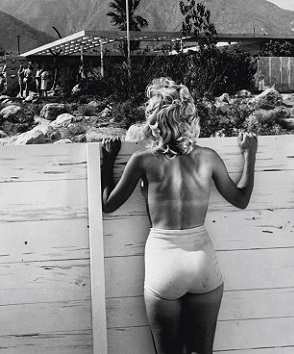 This was brought about by their dimwitted decision to not have ANY recording sessions throughout 1948 due to the recording ban, yet independent labels across America were violating that edict left and right by the summer of 1948 because their livelihood depended on staying current with the latest hit sounds. Maybe because Miracle Records was located in Chicago which was also home to union chief James Petrillo, meaning he’d be more likely to catch wind of their illicit sessions, that explains what they were thinking, but it DOESN’T explain their refusal to alter their thinking in order to stay relevant. So when the ban ended in late 1948 they were now playing catch up and as such that first Thompson single of 1949 culled from the 1947 leftovers were completely out of date and it was only Sonny’s name recognition which got them even cursory attention. They further compounded this mistake by not having Thompson cutting sessions as soon as humanly possible once the musician’s strike was over in December ’48. Instead they wasted even more time before finally bringing him back in the studio in April. That’s when he recorded his next hit, Still Gone, but while a good song it was also a blatant attempt to recapture the feel of his initial hit, now more than a full year old. They were pretty unambiguous about it too, even calling it “Part 3 & 4” just so there was no mistaking it as a direct sequel. While it was actually pretty creative beyond that obvious veneer, listeners were only mildly intrigued and it lasted two weeks on the charts. That’s why just looking at the fact they all charted doesn’t tell the full story. Sonny Thompson’s creative momentum had stalled, his grip on the rock audience was loosening and if you’re clearly regressing each time out commercially and aesthetically it doesn’t bode well for your future prospects. Which brings us to the problem of Thompson’s continuing relevance as an artist, this one stylistic rather than business related. He was a pianist in a style that relied on gritty tenor saxes – and in time vibrant guitarists – to continually push its audiences buttons. He was a musician, not a vocalist (though he would sing in due time), and instrumentals by virtue of having half of the components available to connect with listeners were at a disadvantage in many ways. How many different approaches could you come up with after all? Lastly and most crucially his biggest hit had been something of a fluke. A great composition and arrangement for which he deserves full credit and exceedingly well played by everyone involved, but they’d stumbled into it when they started messing around in the studio after a desultory session for an under-powered singer. Had they been brought in on their own and told to come up with a riveting instrumental out of the blue what are the odds they’d have had the same moment of inspiration when under the gun like that? Now far from marking the end of Thompson’s career this downturn actually would wind up being beneficial for him in the long run because he was smart enough to realize all of these things were true and that it was folly to keep chasing the carrot on the stick and trying to match that one record. Instead he began turning his attention elsewhere – writing for others, producing records and working with vocalists while cutting instrumentals on the side under his own name. If one of those should hit, all the better, but if not he’d still have plenty of other avenues to continue to explore. But we’re not quite at that stage yet and it would take a move to another label with far more resources, a far deeper roster of artists to work with and far different expectations for him by that company who weren’t reliant on his own sales as an artist to stay afloat. 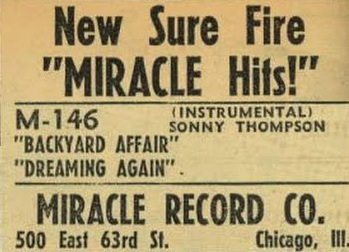 For the time being though Miracle Records saw their fate tied to his and with Backyard Affair I’m sure even they had to know things weren’t looking too good for any of them as 1949 inched towards a close. Let’s start off the music portion of the review by asking the rhetorical question just how ill-suited was this for the market they’d only recently ruled and still hoped to win over? Well, the creeping piano that leads it off gives you your answer right away, as it’s hardly very exhilarating and is soon joined by a full horn section which is playing demurely and at least three years out of date. If your math isn’t so great let’s help you and say that puts this squarely in 1946, a full year before rock ‘n’ roll came into existence. Yeah, right there that’s about all you need to know regarding its prospects in mid-to-late 1949. But there are a few attributes of Backyard Affair that keep it from being buried in an unmarked grave IN that backyard, even if you should have your shovels ready just in case. Thompson, who was the weakest aspect on the top side of this, Dreaming Again, contributes a few moments that are at least interesting to hear and keep you awake. Though his mid-song solo is much too long, not to mention all over the place, he manages to hold your attention with some decent playing from the 1:12 mark to about 1:40 that has some semblance of rhythmic adventurism before getting carried away with himself and losing his way altogether. Admittedly that’s not much to recommend this, and for the record we aren’t recommending it, but it’s hard to completely tear somebody to shreds who we’ve come to admire, albeit for traits he seems to have abandoned altogether, namely a sense of purpose and a stubborn streak of creativity even in the face of increased pressure to repeat his earlier prototypes to the letter. Miracle Records might’ve been smarter simply to grab the tapes for Long Gone off the shelf and speed them up, or play them backwards and call it something else, because there’s no way in the world that something as mundane as Backyard Affair was going to draw so much as a second glance. Honestly, if it was your partner who was having this backyard affair you’d not only let them fool around with someone else, but you might lend them your car for the evening or give them your bedroom for the night even, because listening to them canoodle like this wouldn’t cost you a wink of sleep if you were spending the night on the couch. Songs like this wreak havoc on your sense of fairness when it comes to evaluating artists because it’s not as if they’re out of tune or stumbling all over themselves. There’s every indication that they’re all reasonably good musicians, albeit with a bit too much aimless ambition for the requirements of rock ‘n’ roll, at least in this case. Yet that’s what we’re about around here, determining whether the records in question are suitable for rock in the era in which they were released and deciding if they meet expectations, surpass expectations or, as happens with Backyard Affair, fail to come anywhere close to our expectations. But while in no way suited to the rock fan’s tastes the song also doesn’t cut the mustard if their intent was to bend the ear of those inclined towards a jazzier style, or a bluesier one, or even those with pop sensibilities. There may be moments within that intrigue you if you’re more in tune with those genres but it’s hardly fulfilling the requirements in any of those genres either making this fall short no matter your perspective. Maybe what it shows is that by this point Sonny Thompson had become creatively restless and didn’t feel he had the platform with which to explore any of his other musical urges and so he simply haphazardly lumped them all together in this one song before he moved on to something else entirely. That the “something else” would come for somebody else as Miracle Records was nearing the end of the line. This was the first Thompson release not to chart at all and that failure to bring in some much needed cash couldn’t have come at a worse time for the label, his contract was up, the company was having distributor problems and cash flow issues stemming from a lack of recent hits. This record seems to encapsulate all of the problems surrounding each one of them. The label didn’t have enough artists to offset a dry spell from one or two, nor did they have enough high quality product of their biggest artists to be more selective in what they released, while Thompson himself had musical ambitions that took him away from his strengths as well as from the public’s tastes. Ultimately those are hard obstacles to overcome no matter who you are. 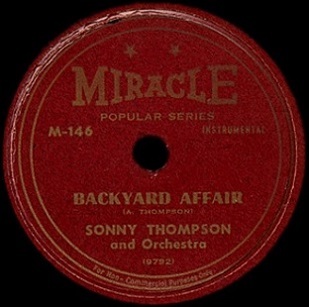 Leave a reply on "Sonny Thompson: “Backyard Affair”"